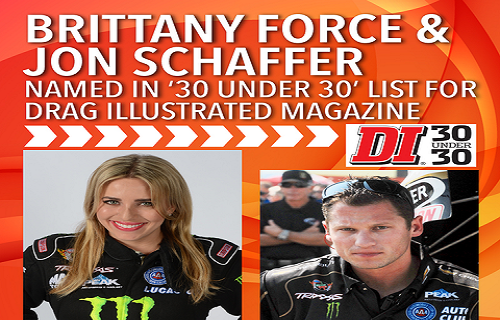 Top Fuel driver Brittany Force (John Force Racing) was one of those recognized as a member of Drag Illustrated inaugural “30 under 30.” She joined Pro Stock driver Vincent Nobile, and Top Fuel’s Leah Pritchett on this list of the “most impressive young drivers, mechanical minds and businesspeople in…drag racing.” The members are the subject of Drag Illustrated’s “Tomorrow Issue,” which will be released at the upcoming Performance Racing Industry (PRI) trade show in Indianapolis. Funny Car crew chief Jon Schaffer was also announced as a member. Force just emerged from her third year driving the Monster Energy Top Fuel dragster with her best performance to date. At only 28 years old, Force took two final rounds, a No. 1 qualifier and was as high as No. 3 in the Top Fuel points during the 2015 Countdown before ultimately settling into the No. 7 position to end the season. 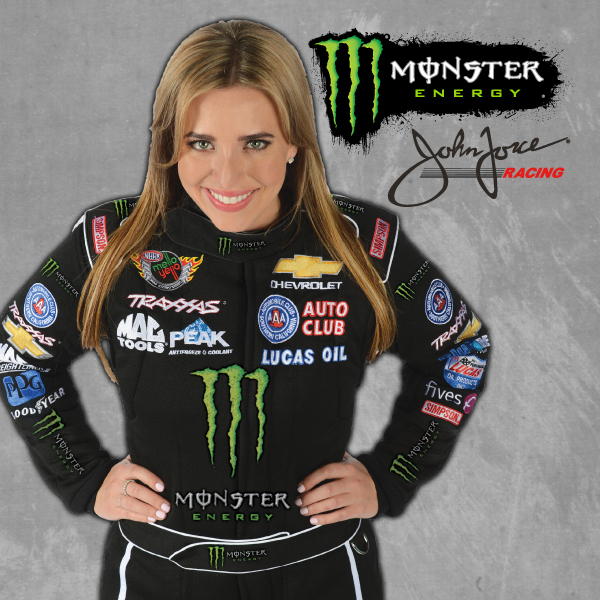 She and her sister, Courtney Force, also secured a multi-year sponsorship with Monster Energy within this past year. Alongside Force, Shaffer completed his first full season as crew chief for 16-time Funny Car champion John Force. He led [John] Force to two wins, two runner-up finishes, and a Top Ten finish in the NHRA Mello Yello Funny Car point standings in 2015. Also appearing in the Tomorrow Issue as part of the Drag Illustrated 30 under 30 list are Vincent Nobile, who will be on the cover, Leah Pritchett, Rickie Jones, Jr., Drew Skillman, Megan Fessel-Schumacher, Troy Coughlin, Jr., and Steven Whiteley. The Sportsman racing ranks are represented by Jonnie Lindberg, JP Gutierrez, Corey Michalek, Ashley Sanford, Mia Tedesco, Cameron Ferre, Justen Moser, Kirk Wolf, and PJ North. 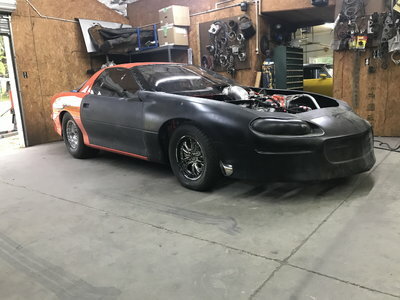 The PDRA, nostaliga and small-tire racing representatives are Lizzy Musi, Kyle Dvorak, Preston Tanner, Matt Sackman, Mark Savage, Jimmy Sackuvich, Tyler Crossnoe, Daniel Pharris, Jared Johnston, Audrey Worm, Tera Wendland-Graves, and Donovan Scott.